Originally released for the PlayStation 4 back in 2017, Yonder: The Cloud Catcher Chronicles has found its way to the Xbox One. 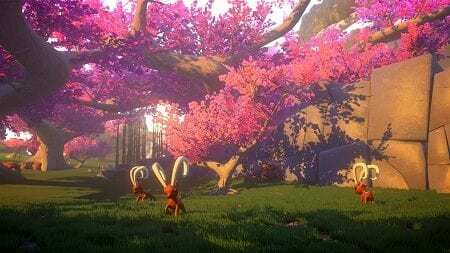 The debut effort from Indie developer Prideful Sloth, Yonder carries a distinctly laid back vibe as an adventure game bereft of the usual genre accouterments like platforming, puzzles, enemies and more. Your time in Yonder is spent walking around and completing various quests, interspersed with a range of secondary tasks like smashing rocks, chopping down trees and harvesting wheat. As you approach objects a balloon will appear above your head with the necessary tool, and if you want said resource you’ll find it in your inventory and interact with that object. It’s extremely straightforward. Fishing is the only activity to feature any sort of challenge as after you cast you’ll move the bobber around until you get a nibble. Once a fish is on the hook you’ll need to reel it in by moving the stick opposite whatever direction the fish is headed. You may lose the first couple of fish, but after that it becomes rather easy as well. Although pleasant enough to explore, the world of Gemea looks like something out of the Xbox 360 era with very basic textures and modest amounts of detail. As you’d expect, there’s a diverse collection of biomes with lots of woods, open plains, snowy mountains and the like. It’s not a vast sandbox, but it’s still plenty big enough. Probably the presentation’s most appealing element is the creatures, which are typically cutesy takes on real-world animals such as the moose-like groffle or the squirrel-inspired squomble. The collectible sprites feature a Pokémon feel as well. On the audio front, mellow tunes accompany your journey, complementing the game’s overtly relaxed vibe. As an unnamed hero you end up shipwrecked on Gemea, an island inhabited by friendly folks and critters that are being intruded upon by a mysterious fog known as the murk. In the broadest sense, it’s your quest to discover the origin of the murk, learn how to eliminate it and then go about assembling and/or repairing the devices necessary to do so. Cut scenes and conversations move the plot forward, but there isn’t much meat on the bone. It’s enough to push you from one primary mission to the next and little more. In addition to the main quest there are a number of secondary objectives from NPCs. Clearing the main path and “finishing the game” is only a fraction of what Yonder has to offer, however. …except that there kind of isn’t. All those things exist in such a superficial fashion that you’re likely to grow tired of them well before the game wants you to. OK, you can build new and better fences and feeding troughs for your livestock, but to what end? There’s nothing to really do on the farm, and the level of customization is dwarfed by the likes of Dragon Quest Builders, much less Minecraft. You can scour the world for all 26 sprites, but why? You only need a fraction of that to reach the end of the main quest, and again, they don’t really do anything. Catch all the fish, seek all the constellations, become a master in the brewer’s guild or don’t. Minus any need to level up or prepare for combat the only driving force in Yonder is you. It all adds up to an interesting experience that isn’t entirely like anything we’ve played before. Sure, you can spot the influence of something like Harvest Moon, but we never even felt the sense of drive here that we’d felt in other subdued titles. Yonder: The Cloud Catcher Chronicles made for a mostly enjoyable time for a half-dozen or so hours, offering an unusually tranquil world to explore. Its numerous side activities failed to engage us, however, and it’s a definitely a title where mileage can vary greatly from one gamer to the next. This entry was posted on Saturday, March 2nd, 2019 at 4:15 am	and is filed under Herija Green, Video Game Reviews. You can follow any responses to this entry through the RSS 2.0 feed. Both comments and pings are currently closed.